You can't really visit Southern Spain without experiencing a real, quality and pure flamenco show, can you? But how can you make sure you will enjoy a proper show? Well, trust our teal of entertainment managers as they will propose you the best of the best in terms of real flamenco bands available in Andalusia. We can organize anything from "flamenco fusion" trios to "deep" flamenco groups of 5, 6, 7 or 8 artists to entertain your post-dinner party. Just contact us with your group details and expectations and we'll send you several options, pictures and videos of precvious corporate entertainment we have organized. 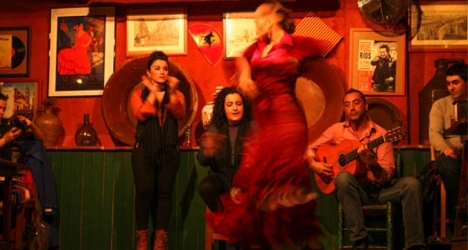 Our flamenco groups are not the standard touristic ones, but real professionals whose objective is only to make you discover the Andalucian musical culture in a professional and interactive way. Flamenco shows are generally performed after the meal, starting during the desert, but we are flexible and happy to meet your expectations.